Atlanta Motor Speedway has been hosting motorsports events for more than 58 years beginning with the first NASCAR sanctioned race in 1960. Only recently - within the last 12 years - have drivers have taken to straight-line drag racing in the O'Reilly Auto Parts Friday Night Drags to see who is the fastest on the 1/8-mile pit lane drag strip. This Friday night, the 1960s will return to Atlanta Motor Speedway as the facility is transformed into a drag strip of yesteryear for the Southeast Gassers Association Nostalgia Night presented by Harbin's Mechanical Services at Friday Night Drags. The exhibition races will be woven into the regular drag eliminations throughout the night. "All the cars are 1967 model year or older," said Rocky Platt, driver of the nostalgic Dixie Twister and member of the SE Gassers Association. "We have a set of rules we run by to how it was back in the '60s that makes the cars match up better." With 22 confirmed vintage dragsters, the SE Gassers will step back in time with 1960's era cars and rules with wheels up launches, and drivers banging the gears of their four speeds that will transport fans back to drag strips of that era. The "Gassers" get their name from running on nothing more than race gas - no nitrous or alcohol is utilized. "It's four speeds and wheels in the air," said Platt when asked what fans should expect to see this Friday night. "Some of these guys have wheels in the air in first gear and second gear while some also have the wheels in the air in third gear. They all run from 100 to 120 miles an hour over an eighth mile." Adding to the ambiance and typical of a drag strip in the '60's, back up girls will also make an appearance at Friday Night Drags helping to back-up and line-up the "Gassers" for their pass down the strip. "Back when they raced in the '60, they had back up girls," said Platt. "They wore go-go boots and miniskirts. We have back up girls who back the cars up after they do the burnouts. There will be at least half a dozen girls backing the cars up, so it's pretty neat too." Two of the cars that will make an appearance as part of the night include a pair of replicas of famous Georgia dragsters of the era. 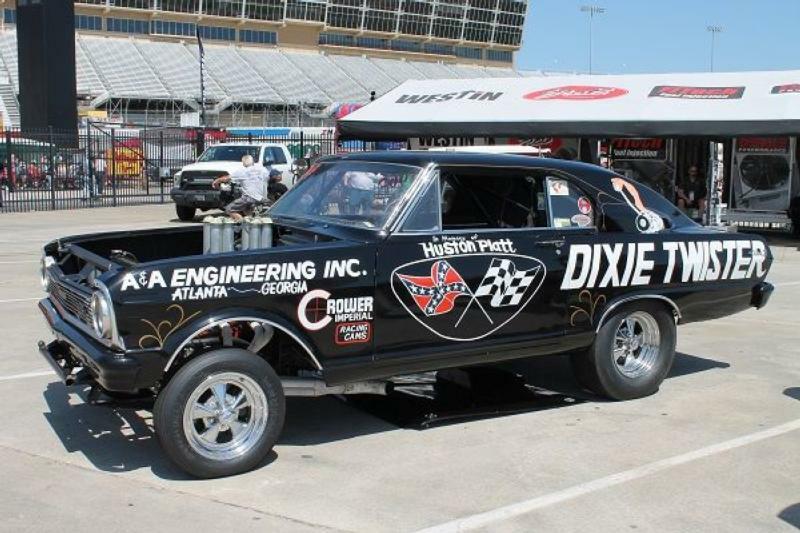 Fans will have an opportunity to see the Dixie Twister and Georgia Shaker compete on the pit lane drag strip. Originally piloted by drag racing hall of fame drivers Houston and Hubert Platt respectively, their son's Rocky and Allen will bring the cars back to life when they compete on Friday night. "We've got a lot of people coming out just to see those two cars," said Platt. "My cousin and I are match racing two replicas of our father's old race cars. We follow the SE Gassers and match race exhibitions with the Dixie Twister and Georgia Shaker." Although it is just an exhibition event, Friday's appearance by the SE Gassers Association at Friday Night Drags is just one of twelve races on the calendar for the organization. "You got some of the best drivers in the world driving these cars," said Platt. "Most of these cars are built in people's garages. They aren't built in big fancy shops but built like they were back in the day."